The first blog entry for “My Walden” came directly from the first page of Thoreau’s reflections, midway into his second paragraph in the first chapter “Economy”. This second post which I hope you will truly take the time to explore, comes from paragraph three and four, ahhh… the incredible teachings, that like history we perpetuate and hit repeat. 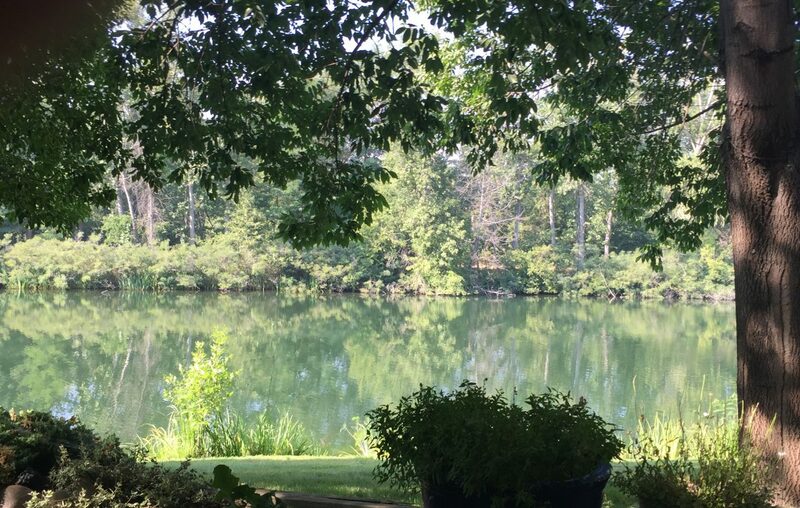 As I sit here quietly on the deck of “My Walden”, I am blessed to observe the playful shenanigans of two squirrels, a floating duck on a glass still pond and the chatting walkers’ across the way who absorb a wee bit of nature while they mosey. The sun plays peek a boo through the clouds and the buzz of distant traffic reminds me that a very chaotic world exists beyond my sanctuary. In the times of Thoreau and today, to be a land owner is celebrated; to “own” your home, property, a piece of the planet. I used to “own” a small morsel of land that cradled a little home. Of course I did not “own” it, the bank did and when the crash of 2008-2009 blazed through, I lost it. At times I miss that place, however I am clear, it is not so much the home or the land I miss, it is the memories created there. The time shared with others, the experiences and rituals established with neighbors. “Losing it all” has given a perspective from which to reflect and explore. Is home ownership all that it is marketed to be? Hmmm.., I am not so sure, for one can easily become slave to the home, its upkeep and maintenance, the time and separation it creates from others. As Thoreau so wisely stated, is your home a place of celebration or penance? When you are lying on your death bed, will it be the home you remember and cherish, or will it be the times shared with others inside those walls that comfort you during your last breaths? I am most certainly not against home/land ownership, I do however wish to question how your time is spent within the walls of such ownership. Does it line up with your passions, your dreams, your desires? Does it gift you with freedom to play, to connect, to be with those you love, doing what you love? Or does it begin the downslide to the digging of your grave? Is it a noose or wings? We supposedly live in the “Land of the Free”, yet all around me I observe like Thoreau a people doing penance. Living life for the tomorrows which never come. Waiting until…!! Then they find themselves alone, broke, and lying in a bed of regret. I continue to be grateful for the wisdom I gleaned from the patients I cared for in a nursing home during my early twenties. The stories they shared highlighted for me what was most important – the connection with others and living a life filled with passion and faith. There is value in learning from what resides in our rearview mirror, however, be careful that your history does not become your limiting belief/story. Celebrating our present moments with complete awareness guides us into our tomorrows full of inspired dreams. Are you living a life full of passion, joy, love, and co-creating? Are you burdened by the things you own, are they the ball and chain that keeps you stuck? Are you waiting for tomorrow, or “when I have…” I will do this and go for that? In closing I can say with certainty that we all have a few things in common – we were born, we will die, we all have 24 hours each day and our personal quality of life is directly tied to the choices we make in our present moments. It echoes what you share, Dear Sister. Any time I make a purchase I ask myself…..does it serve a purpose? Or will it bring me joy? If I can answer yes to either, OK. But if it’s for no real reason, then no need to have it. What a great video!! And thank you for your comment and taking the time to share the video – a good one for us all :-).